EURUSD is under the influence of French Trade Balance and French 10-year Bond Auction for EUR and the Natural Gas Storage, Consumer Credit m/m and the Unemployment Claims for USD today therefore the pair would act more volatile. Although it seems that EUR is weakening, it has covered some loses and is getting stronger. The price is climbing the ascendant channel above the weekly pivot point at 1.13260. The support lies at 1.13500 with resistance at 1.14500. The MACD indicator is in positive territory signaling the price growth and the RSI is above the 50 level confirming this suggestion. Moreover, the EMA of 20 is staying above the EMA of 50. 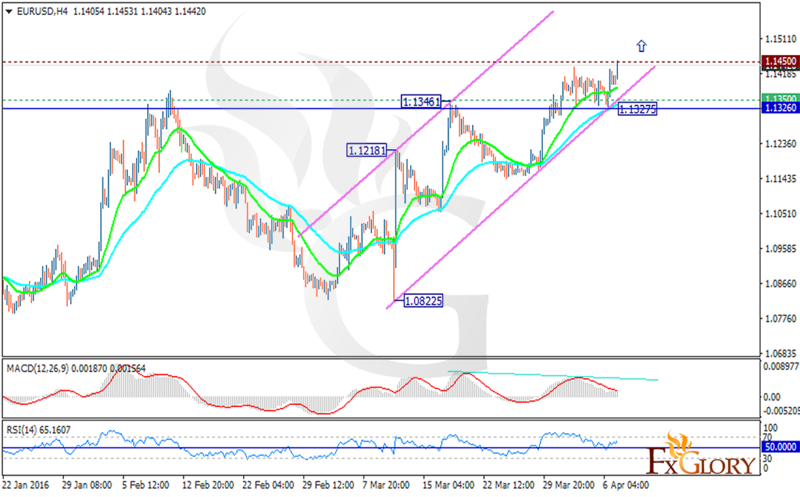 Long positions are recommended with the target of 1.1550.